Gold jewellery has enhanced a woman's beauty manifold since forever. And, a gold set is among the most adorned form of gold jewellery for women. A gold pendant set is one of the most favoured form of gift for a bride in weddings or as a gift for any occasion for women and babies. 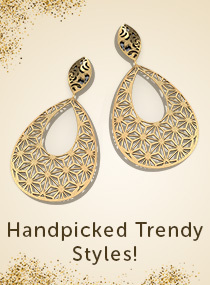 CaratLane's collection of beautifully crafted jewellery set designs are unique and dynamic. 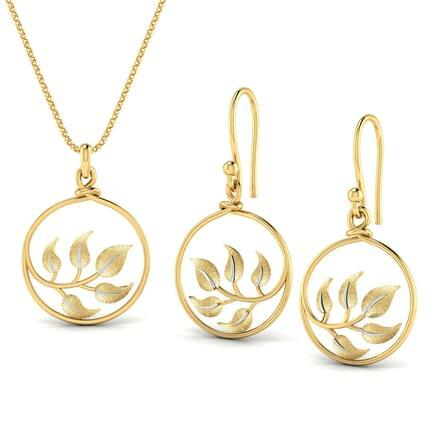 From simple gold pendant set with earrings to a bold and chunky gold set, there is an outstanding model for everyone. 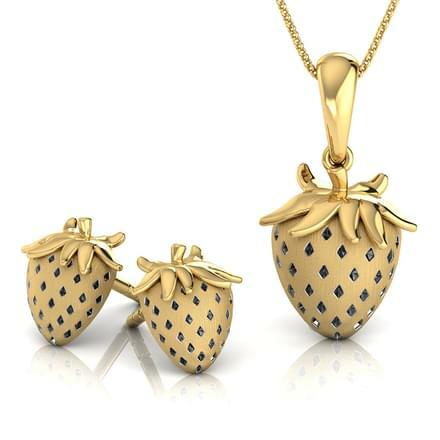 A gold pendant set can be a great gift for a baby's first birthday as well. A gold set can be worn in weddings, as workwear, every day wear as well as for special evening outings. 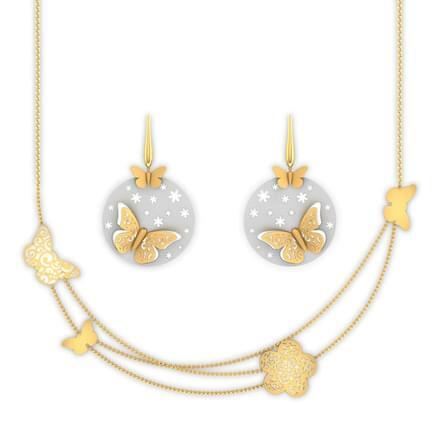 CaratLane boasts of more than 60 stunning gold set designs for women and babies. 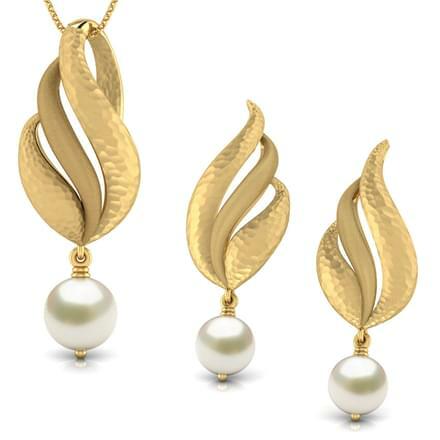 The pricing of the gold jewellery set designs varies between Rs. 10,000 to Rs. 1,50,000. 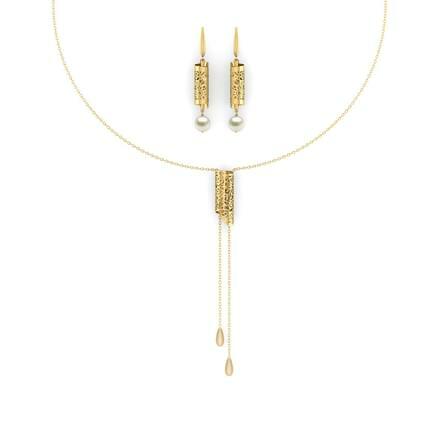 The gold set models are set in 18K and 22K yellow gold and 18K rose gold. 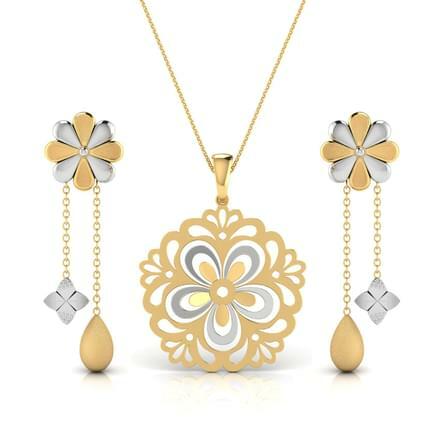 From casual, contemporary, to designer, and floral designs, there is no dearth of stylish gold sets available online on CaratLane. You can pick from a gemstone studded gold pendant set or a tassle-inspired pendant. 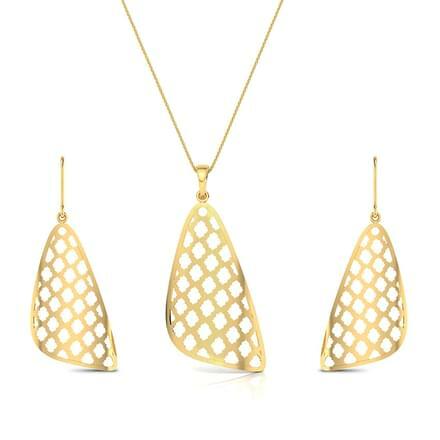 A gold set is a style that befits any and every occasion, from casual parties, to office to weddings. A gold set is an evergreen style of wearing gold jewellery by women. 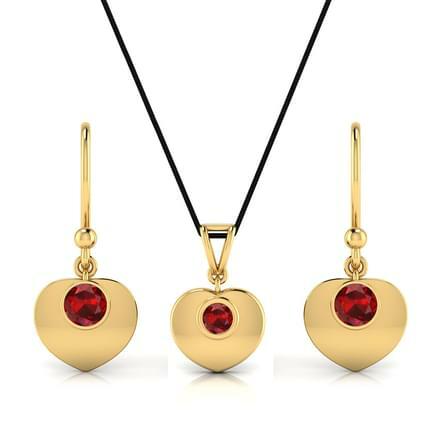 Matching gemstone studded earrings with a pendant are a classic style of gold set convenient for wearing every day. 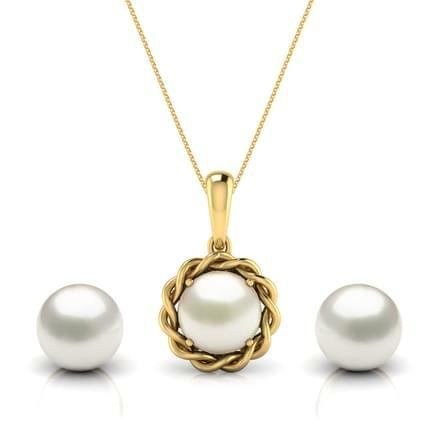 CaratLane's the Simplicitty Pearl Matching Set, the Svelte Sun Matching Set and the Simply Petite Matching Set, all set in 18K yellow gold are sparkling gold pendant sets. A gold set in rose gold is among the highest in demand by women of all ages. The simple and suave design, the Ena Hammered Matching Set, made in 18K rose gold with pearls is a great every day wear style for women. 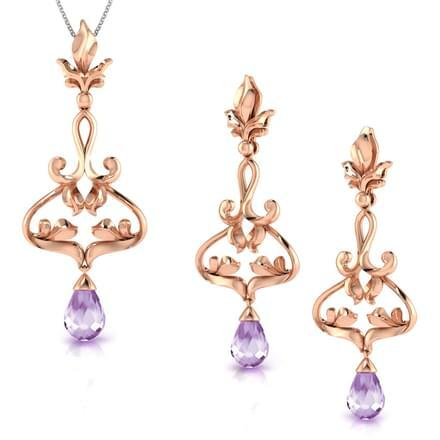 The fine craftsmanship of the Enticing Filigree Matching Set and the Florid Filigree Matching Set, set in 18K rose gold, pearl and amethyst are designs that stand out from the rest. 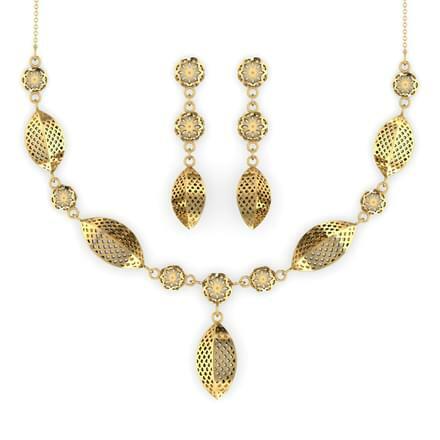 Heavy set gold jewellery set designs are perfect for bridal wear. CaratLane offers some unique designs for women who wish to flaunt a gold set on their wedding day. 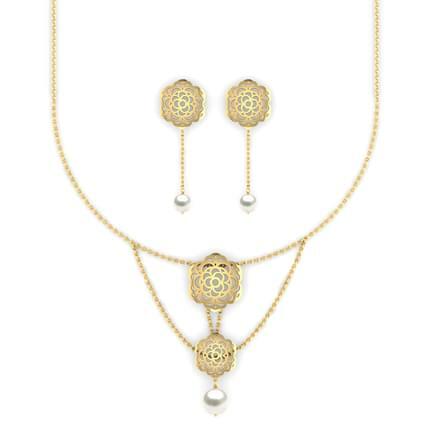 The Aashi Filigree Matching Set, set in 22K yellow gold and pearl beads is a traditional design of a gold pendant set with earrings for women. 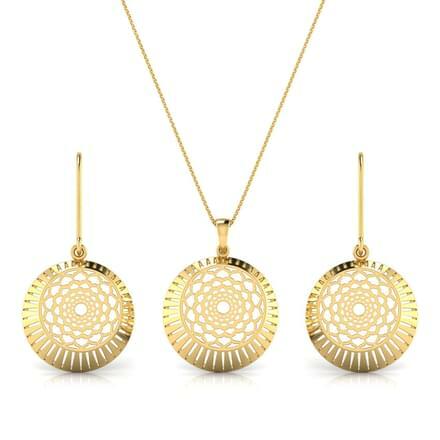 The Miya Stamped Matching Set, set in 18K yellow gold is a perfect example of a contemporary design of gold jewellery which can be easily adorned with both traditional as well as western attire by women. The Sandy Stamped Matching Set, in 18K yellow gold and amethyst is an outstanding multi-layered necklace design with matching earrings for women. 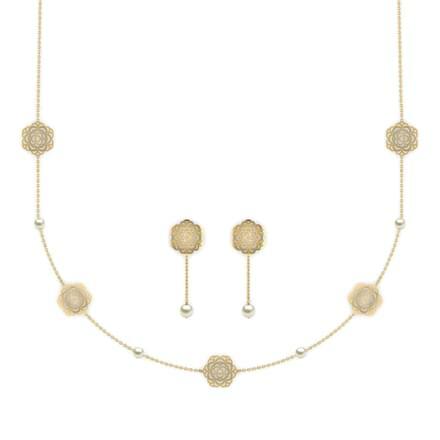 A gold set inspired by tassels are a modern take to a classic frill design and is among new favourites of many. The Symmetric Jharokha Matching Set, made in 22K yellow gold by CaratLane is a unique design which is well crafted too. Classic designs of a gold pendant are here to stay and can never be replaced by as many new and upcoming designs possible. The Jane Matching Set and the Emma Frill Matching Set, both set in 18K yellow gold are great examples of beautiful gold pendant designs. 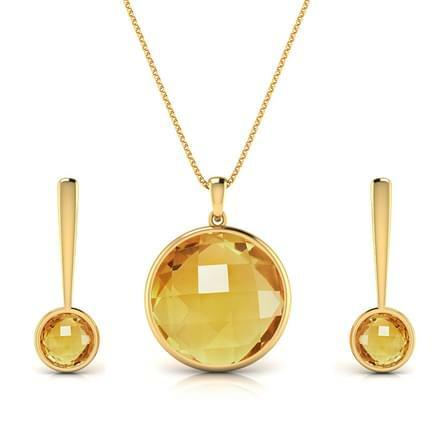 The Rose on Disc Matching Set, set in 18K yellow gold is a great example of fine craftsmanship. 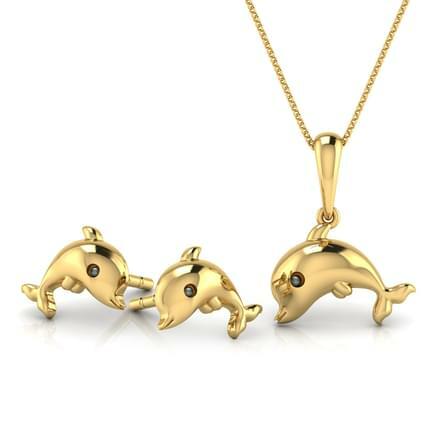 A gold set can be a beautiful memory as a child's first gold jewellery. 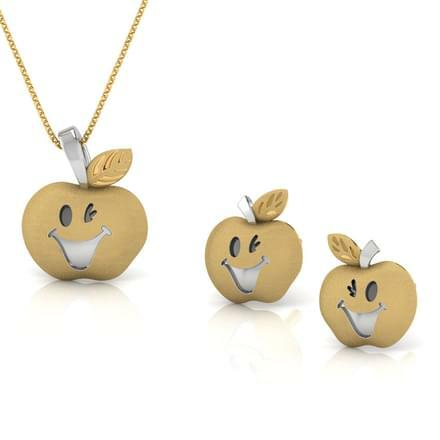 You can dress up your little one with a pretty gold pedant set. 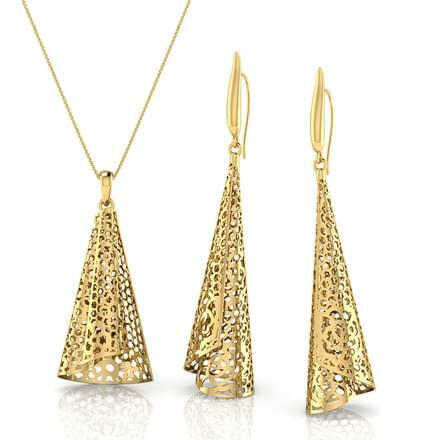 Check out CaratLane's collection of gold sets! 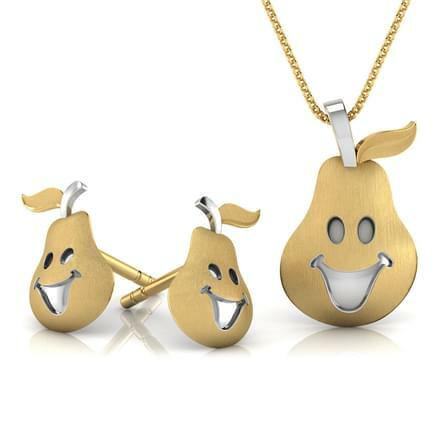 CaratLane's fruit-inspired designs such as the Perry Pear Matching Set or the Quinn Strawberry Matching Set, both set in 18K yellow gold are indeed sweet gold pendant designs. 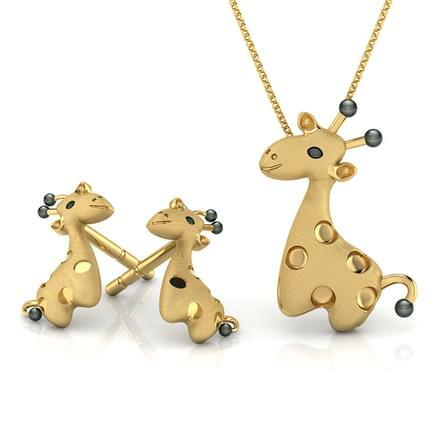 Animal-inspired patterns including gold jewellery set designs like the Arlette Butterfly Matching Set and the Clarabel Giraffe Matching Set, both set in 18K yellow gold are very charming gold set designs. 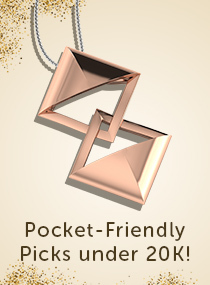 Shop Gold Jewellery at CaratLane! 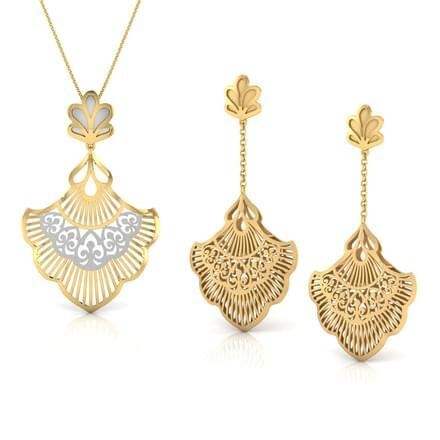 CaratLane has created a vast range of designs of gold sets, along with great quality and prices. The portal is pushing towards the top due to its customer-centric policies and a content online shopping experience. Its customers can make online payments through multiple modes such as net banking, credit or debit cards, and online funds transfers. 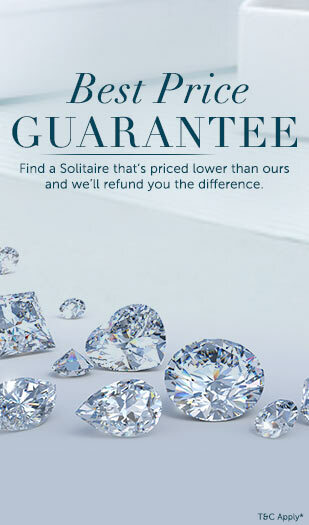 CaratLane offers a 30-day free return and a lifetime exchange policy as well. The customers can also use its Try@Home option to try their favourite ornament before complete payments are made. Enjoy a great online shopping experience at CaratLane!